WELCOME HOME!!! BEAUTIFUL & WELL MAINTAINED PORT RICHEY HOME. 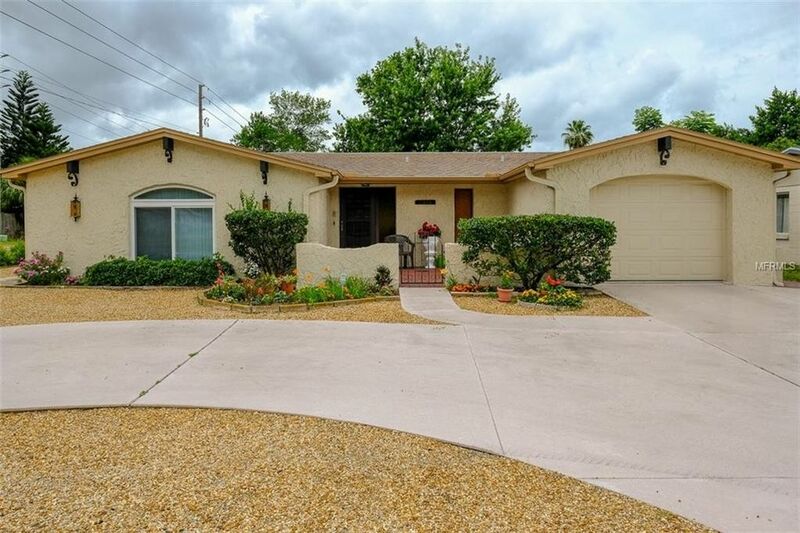 LOCATED ON A SPECTACULAR CORNER LOT WITH A LOVELY STONE YARD FOR EASY MAINTENANCE. THIS 2/2/1 HOME HAS MANY UPDATES INCLUDING THE AC(2016), HOT WATER HEATER(2016), TEXTURED CEILINGS, DOUBLE PANE WINDOWS(2003), AND ROOF(2003). THE HOME HAS BEEN OWNED BY THE SAME FAMILY SINCE 1974! THIS MARVELOUS HOME FEATURES AN OPEN FLOORPLAN THAT INCLUDES THE FAMILY ROOM, KITCHEN AND DINING ROOM WITH NEWER WOOD LAMINATE FLOORING. THE SPLIT FLOORPLAN IS IDEAL FOR PRIVACY. THE KITCHEN FEATURES INCLUDE CERAMIC TILE FLOORING, LAMINATE COUNTERTOPS, DESK AREA, OVEN/RANGE AND REFRIGERATOR. THE GORGEOUS FLORIDA ROOM HAS NEWER CERAMIC TILE FLOORS AND A CEILING FAN. THE TREMENDOUS SUNKEN LIVING ROOM LOCATED IN THE FRONT OF THE HOME HAS NEWER WOOD LAMINATE FLOORING AND A RETRO DECORATIVE MIRRORED WALL. THE LARGE MASTER BEDROOM FEATURES A WALK-IN CLOSET AND CARPET FLOORING. THE MASTER BATHROOM HAS BEEN RECENTLY UPDATED WITH A WALK-IN SHOWER THAT HAS STYLISH TILED WALLS, PEBBLE STONE SHOWER FLOOR AND A VANITY WITH A SOLID SURFACE COUNTERTOP. THE 2ND BEDROOM HAS CARPET FLOORING AND A SIZABLE CLOSET. THE 2ND BATHROOM FEATURES DUAL SINKS AND A SHOWER/TUB COMBO. THE 1 CAR GARAGE INCLUDES THE WASHER AND DRYER WITH ENOUGH ROOM TO PARK YOUR VEHICLE. THIS HOME HAD SUBSIDENCE ISSUES AND HAS BEEN PROFESSIONALLY REPAIRED BY RAMJACK. THE REMEDIATION FOR THE SUBSIDENCE WAS COMPLETED IN 2014. ENGINEER REPORT IS AVAILABLE UPON REQUEST. Directions: TAKE US HWY 19 N TO EAST ON RANCH RD. RANCH RD EAST TO NORTH ON MCKINLEY DR. HOME IS LOCATED ON THE CORNER LOT OF MCKINLEY AND RANCH RD.